The wedding is the first step to a lifetime of joy and happiness together. That’s why the SAN DIEGAN has taken the time to extensively research these venues, so you can have the perfect wedding. Browse through the wonderful selection of romantic and scenic venues, whether on the bay, with a vineyard view or in a romantic hotel, this will be your day to remember. If you’re in the military or a veteran, there are also some locations that might be a perfect fit for you here. Click here to request an event estimate! Up Your Alley has an entire room devoted to wedding attire: wonderful vintage wedding gowns appropriate for the popular Temecula Wine Country weddings. Located in Temecula Wine Country, Up Your Alley’s slogan is “Outrageously Feminine Attire,” and one tour around its three luscious rooms will tell you why. Weddings are the most important day of your life. You deserve a setting that exceeds your expectations. Ponte welcome you to celebrate your marriage surrounded by 300 acres of vineyards, lush gardens and the tranquil, romantic ambience of Ponte Winery. They also offer banquet facilities to hold your events, group dinners and more! Orfila Vineyards & Winery is undoubtedly the best winery in San Diego County. It’s also the oldest active winery in San Diego County. It has won more gold medals than any other winery. And their wines have also been served at the White House. Founded in 1798, Old Mission San Luis Rey de Francia, known as the “King of the Missions,” is a National Historic Landmark. It is the largest California mission. The church today is used for weddings, funerals, and concerts. For information on weddings and other events. It is also great for hosting parties, events and meetings. 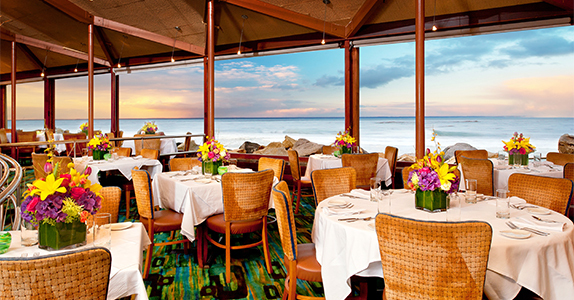 Birch Aquarium at Scripps is situated on a spectacular site overlooking the Pacific Ocean. Your guests can explore colorful marine life while experiencing the frontiers of marine science through hands-on museum exhibits. Our beautiful wedding venue will create lasting memories for each and every one of your guests. The Chart House Restaurant’s professionally trained staff specializes in cocktail soirées, wedding receptions, and business dinners. We will customize a menu to meet your needs and satisfy your guests’ tastes. Elevated semi-private seating for up to 40 guests; Reserve the entire restaurant for private dining for up to 200 guests. Humphreys Half Moon Inn & Suites is ideally located on Shelter Island, San Diego’s own Hawaiian Isle. This tropical resort-style San Diego hotel, framed by America’s Cup Harbor and the San Diego Bay, offers breathtaking views of the hotel’s private marina and downtown San Diego. The Maritime Museum of San Diego makes her historic ships available for having corporate events, private events, team building programs, tall ship sailing charters and beautiful waterfront wedding receptions. The fascinating floating museum at the Embarcadero consists of six historic ships and two submarines. San Diego Botanic Garden is San Diego County’s location of choice for your uniquely picturesque and memorable outdoor wedding or reception.With a mild year-round climate, the Garden offers a variety of garden settings for your event, from our large Gazebo Lawn Garden to our Waterfall View Deck and Walled or Lawn House Gardens. The USS Midway Museum is an immensely popular event venue. Its unique downtown location, convention center proximity and 360-degree panorama view make it an unparalleled venue for every occasion. The Midway can accommodate events for up to 3,500 guests. It’s a must-see San Diego attraction.